Every makeup junkie is aware of Kryolan and its brilliant products and now all of us in Delhi can get our hands on it too. 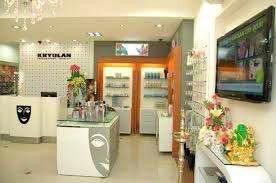 Kryolan's store in the Lajpat Nagar Market offers a complete range of professional makeup for everyone. Kryolan is most popular for its professional eye-shadows and concealers. This offline store is definitely a pilgrimage for many who want to choose what suits them the best. The staff here is helpful and will give you makeup trials so that you make a better decision. The best part is that this store has the complete range of their collection which is not available online and in other stores. It’s a one-stop destination if you are thinking to buy any makeup product.